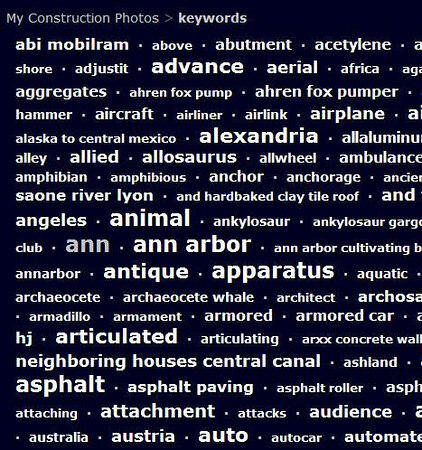 Construction keywords for searching My Construction Equipment Photos. Keywords let us focus on photos showing a specific type of construction, facility, machine, or other interest. This site provides three ways to select and view all photos having a specific keyword or set of keywords. Enter "trench" to get all photos showing a trench. Enter "Ann+Arbor" to get all photos in Ann Arbor. Enter "trench-Ann+Arbor" (or "Ann+Arbor-trench" to get photos of trench in Ann Arbor. Enter "backhoe-trench-Ann+Arbor" (or backhoe-Ann+Arbor-trench or Ann+Arbor-trench-backhoe, etc) to get photos of backhoe and trench in Ann Arbor. 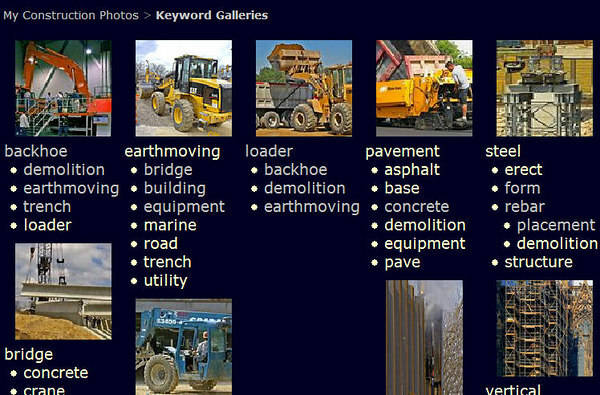 Click on "backhoe" to get all photos of backhoes. Click on "trench" in list below "backhoe" to get all photos that show both a backhoe and a trench. Click (1) "List of Keywords" in Keyword Galleries page or (2) go to http://myconstructionphotos.smugmug.com/keyword/ to get complete listing of keywords for My Construction Photos. Click on any keyword to get all photos that have that keyword. Hover your mouse over any keyword to see the number of photos having that keyword. Today (February 1, 2007) there are 170 backhoe photos and 64 trench photos. More will come.